As the month continues along, the toppings start to thin out a little and become less gourmet, until you’re left with just a dry cracker at the end of the month. Your fridge starts out brimming with delicious and gourmet cheeses, yoghurts, meats and many varieties of yummy organic veggies. There are snacks and nibbles to ensure everyone is happy. 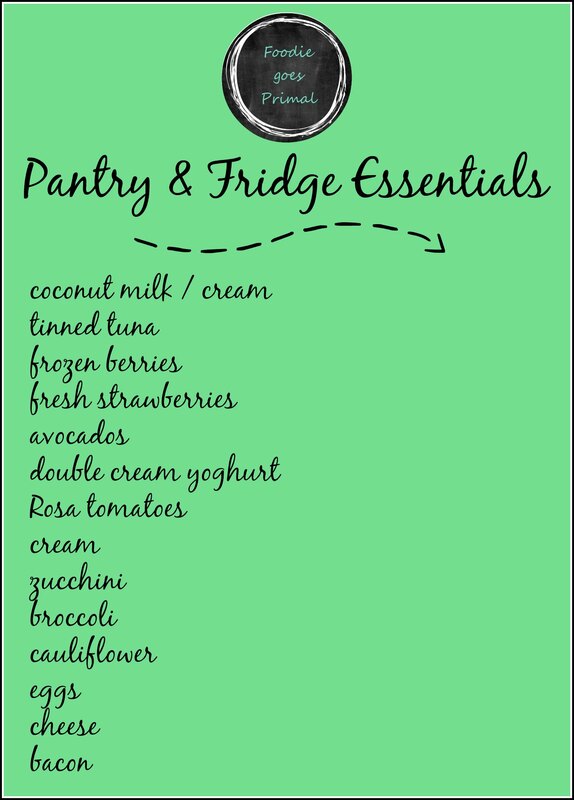 Don’t worry, I’ve compiled a list of 14 LCHF pantry & fridge essentials that will see you through such times and ensure there’s always something delicious to eat. I’m not talking about cupboard basics here, like coconut oil, spices, olive oil, etc. I’m referring to, let’s call them secondary basics, those items that you should always have on hand to make something more spectacular. Ingredients that you can quickly throw together to provide a decent meal. Ingredients to provide satisfaction and enjoyment to your family, even though there’s not much to work with. I always feel hopeful that I can whip up something delicious to eat when I have these ingredients in my fridge and pantry. There are still so many more great ideas for these ingredients – what would yours be for these 14 LCHF pantry & fridge essentials?